The following is a report from Floyd McClung. It speaks for itself. It’s much longer than my usual posts, but don’t rush through reading it–let the Lord speak to your heart. I just returned home from a two-week visit to some of the Syrian refugee camps in the Middle East. Several people have asked me to share about my journey. Following is a summary of some of the things I experienced and learned, though there are many deep emotions I am still processing. I heard heart-rending stories of tragedy and loss as I met with the refugee families. I met men who were suffering from wounds caused in the fighting. I “talked” with one man who survived a bullet wound to the head. The bullet entered his forehead and exited the back of his head. He is paralyzed, cannot speak, and yet he can understand everything. His wife sat beside him holding his hand. In that moment I did not see “a Muslim” but another human being, a man with a family he cannot feed and wounds he cannot get medical attention for. In the same crowded apartment building, I met two brothers, both of whom had recently escaped from prison in Syria. Both brothers had bullet scars and shrapnel wounds. One of the brothers could not lift his left arm because he was tortured in prison – Syrian soldiers cut the tendons and nerves in his arm and wrist while he was held captive. I sat with refugee families who lived in tents, and did not know where the next meal is coming from. I listened as one man said he wants to work but cannot because of his refugee status. That is true for several hundred thousand Syrian men, many from middle-class backgrounds, who are now refugees in Iraq, Turkey, Lebanon and Jordan. They are stateless, hopeless, and lost. And it is illegal for them to take a wage-earning job in their host country. It is hard to assimilate all I witnessed and heard in those few days. I asked the Lord to allow me to feel what He feels and to see what He sees. Perhaps no one outside Syria can really understand what the Syrian refugees have been through. But still, I asked God to touch my heart in a deep and lasting way. He is still doing that in me. I am a man of action, so what I saw and felt is meaningless to me if I don’t do something with it. I will act. I have come back to Cape Town filled with passion and purpose. I feel called to mobilize as many as I can to get involved, to give if they cannot go. What was most striking to me in my talks with the refugees was their spiritual hunger and openness. They longed to know God had not abandoned them. They smiled with sincere appreciation when I spoke to them about His love for them, when I told them He spared their lives, and that He has a purpose for them. I reminded them that He is a creator, and He will create a new life and a new beginning for them. I compared it to being “born again.” No one objected when we spoke of the love of God revealed in Jesus. Several million Syrian people have been forced from their homes, their land and their families because of the war. Some of the families told me about their houses being struck by bombs while they were in them. They lived to tell their story. Other families described the physical pain and discomfort caused by chemical weapons. One mother asked for prayer for her baby boy named Sultan. More than one family had TVs on, blaring continually with live news reports about the fighting. Their TV’s are on night and day. They watch as the “rebels” fight against the Syrian army in their home towns. Places that were names on the news to me previously became more real when I met people from places like Homs, Damascus, Aleppo, and Daraa – where the revolution began. Can you imagine sitting with a family, while in the background a TV showed violent, bloody scenes of gun battles, RPG’s being fired from wrecked buildings, and snipers killing unsuspecting enemy soldiers? It was disturbing. It hit me that they were watching news reports about their family members and hometowns. Most of the refugees grieve without knowing how to grieve. Their culture does not allow them to mourn their losses. Except for the first few hours after death, they cannot acknowledge pain when they lose their fathers, brothers, husbands, and sons to the fighting. When waves of grief overcome them, they can only cry alone with no one to talk to. The refugees struggle with feelings of abandonment by the rest of the world. They feel alone in their struggle against a ruthless regime. Hopelessness was tangible in every conversation. At the same time, in every interaction with the refugees, they were incredibly generous and hospitable. One thing is clear to me above everything else:there is great spiritual hunger and openness to the good news of Jesus. There are several million Syrian people suffering. They experience hunger, hopelessness, and confusion. I was overwhelmed with the desperate longing by the Syrian people I met to be listened to, to be helped, and to hear the good news of God’s love for them. In every home, in every shop, and in every single contact with the refugees, I experienced warm hospitality and generosity.I witnessed amazing grace in the midst of huge tragedy and pain. Everyone we visited served us what food they had. They gave us coffee, tea, cakes, hot meals, and soft drinks – at great sacrifice to themselves. I was humbled and deeply touched by their kindness to me, a stranger. No one turned down prayer. Everyone listened eagerly to the news that God had not forgotten them. They joined us respectfully as I prayed for them in Jesus name. We have to respond while there is still time! This moment of opportunity and need will not last for long. When the immediate crisis is past, people will settle in new countries, or return to Syria to rebuild their homes, and then the opportunity to minister the love of Jesus will not be the same. Many of the refugees will melt into the local culture. Already thousands of them are doing their best to move out of the camps and into the towns and cities in their host countries, such as Lebanon, Jordan, Turkey and Iraq. We have to respond while the people are open! There are hundreds of thousands of refugee children. The UN is overwhelmed by the crisis. UNHCR (United Nations High Commission for Refugees) leaders describe the tragedy as beyond any other faced by the United Nations in recent memory. What can be done? You can give financially to help us send teams and provide food for the refugees. We have volunteers in All Nations lining up, willing to go. Short-term teams can go now to the camps. We can play with their children, listen to their stories, start schools, teach English, hire Arabic speaking translators, help them get medical assistance, and pray with them. We can share the good news of Jesus. Every Syrian refugee has a name, a journey, and a story to tell. If nothing else, we can take a packet of food to a family, then sit and listen, and care for them. We can weep with them. And we can share the love of God with them. I am returning to Lebanon in four weeks time.I would be grateful for your assistance with my travel costs. While there I will help train workers, and I will strategize and plan for meeting needs. I will visit some of the refugees and minister to them. I will arrange accommodation for teams coming in the next few months. The conflict in Syria has created an urgent, unique moment of opportunity. This crisis has an expiry date! It is urgent that we respond now, before the window of opportunity closes. Perhaps we only have 6-12 months to respond to the Syrian refugee crisis. Our response must not be a political response, though we all have our political convictions, but a spiritual and practical one. We, as followers of Christ, offer something no government or UN agency can offer. We must provide aid to those suffering, and we must do so in the name of Jesus, with prayer and the good news of Jesus. Syria as a nation will most likely open to outside help for rebuilding their country once the war ends. We should plan now to be part of that response. There will most likely be ongoing tensions and fighting between various Islamic factions within Syria for many years to come, but the danger involved must not stop us from being involved. Danger is normal for those who get involved in crisis situations. I learned on this trip that the Arab Spring began in Indonesia in 1996, not two years ago in Tunisia.The Arab Spring is bigger and has been going on longer than I realized. It began with the fall of Suharto, the world’s longest serving dictator in the world’s largest Muslim country. It was students demonstrating on the streets of Jakarta in massive numbers that forced his resignation. The “Arab Spring” continues to break out around the Muslim world. The Arab Spring is a spiritual shaking from God. It has shaken Egypt, Tunisia, Libya, Yemen, Malaysia, Somalia, Lebanon, Jordan, Sudan/South Sudan, Iran, and now Syria. It is as significant as the fall of communism in Eastern Europe. The Arab Spring is a spiritual movement and radical terrorism is political response to a spiritual phenomenon. If we see the Middle East through the grid of politics, of what America or the United Nations should or should not do, we will miss what God is up to. We must not think in terms of “radical terrorists” or “extremists” or the “threat to the West…” Much of the Islamic terrorism in the world today is a false-spiritual response to a massive turning of millions of Muslims to Jesus. It is Satan’s way of distracting us, of filling our hearts with fear, anger, and unbelief. We are living in the time of the greatest harvest ever among Muslims coming to faith in Jesus. Of course, Satan is not happy about that – so he is stirring up anger and hatred in the hearts of extremists to act violently, and thus to cause a polarization, a temptation to people in the West to respond in the same spirit. Don’t fall for it! This is a moment in history catalyzed by God to create deep hunger and spiritual crisis in the hearts of people in the Muslim world. It represents a historical turning point in the history of Islam. Respond with prayer, love, and faith, not fear, retaliation or suspicion. See and be impressed with what God is up to, not what the enemy is doing. To be fully understood, the Syrian refugee crisis must be seen in the greater context of the “Arab Spring” and what is happening all over the Muslim world. Though there is a terrible war in Syria with grave injustices on both sides of the conflict, it is happening because God has seen fit to allow the status quo to be unsettled in the Muslim world. Many Muslims are asking why Muslims are killing Muslims? 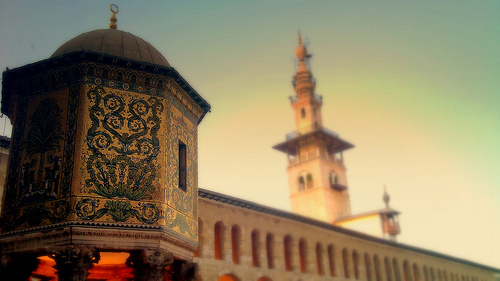 The crisis in Syria is a severe spiritual blow to Islam that represents a split in the heart of Islam, a division between moderate and radical streams of belief. There is a major spiritual conflict/divide taking place within Islam, and this divide represents a unique moment to share the love of Jesus with Muslims. Finally, we must not buy into the dualistic, Western mindset that says we should not “take advantage” of people in crisis situations by offering to pray for them, or sharing the Gospel with them, or inviting them to faith in Jesus. Of course, we should not pressure people or manipulate them into “making decisions” based on what we do for them. But we must follow Jesus’ example and obey His command to announce the good news of the kingdom and to heal them. Sharing the love of Jesus, telling the good news of forgiveness and hope in Christ is not manipulation, but providing the spiritual hope people long for. Sadly, I witnessed relief groups separating their good deeds from the good news of Jesus while on this trip. It convinced me once again that hopelessness and Christ-less ness go hand in hand, and the core of what we do in All Nations is discipling people to faith in Jesus, the hope of the world. Please pray about how you should respond to the Syrian refugees, will you? Please pass on this letter to others, will you? Thank you.